“To dearest Alexander Samoilovich Petrokovsky, with all best memories of our meeting in Tiflis,” - March 22, 1924. The Georgian pianist, Marina Mdivani, winner of the 1961 Marguerite Long-Jacques Thibaud competition and former pupil of Emil Gilels, has kindly brought to our attention a piece of music history that sheds light on the early abilities of a 20-year-old Vladimir Horowitz. The first Horowitz recital with his unforgettable Don Juan was enough to realize that this was a superstar: phenomenal technique, a gem of performance, scales, octaves, virtuoso passages – everything was amazing. The Medtner of the second recital demonstrated that young Horowitz can play as an experienced artist, and that age is not a problem for a great talent. The highest victory of the night was the B-minor Sonata. The famous sonata, the only one composed by Liszt, morphed into a monumental poem, where the demonic and the human elements were battling passionately. This Liszt was unforgettable. Only a few chosen ones are blessed with this ability to feel this composer’s style, to convey his contrasts in such an exceptional manner. The audience was enthralled by Horowitz’s inspired ecstatic rendition of the sonata. The sonata was followed by the equally wonderful rendition of the Spanish Rhapsody, greeted by standing ovation. As an encore, Horowitz performed La Campanella, charming everybody by the crystal-clear sound of bells. 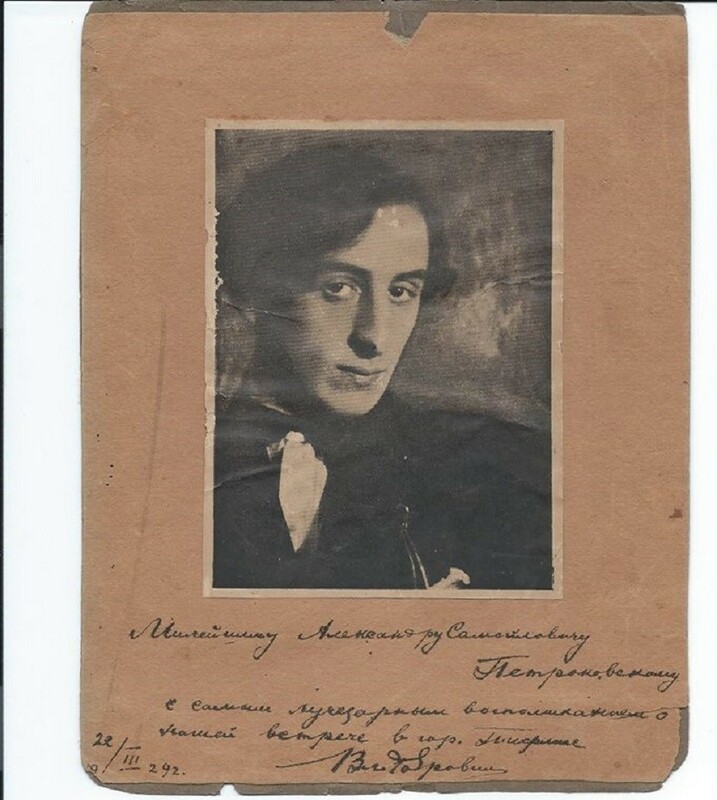 While neither month nor day(s) are included in the piece, a signed photograph of Horowitz has been uncovered, dated March 22, 1924, with the inscription, “To dearest Alexander Samoilovich Petrokovsky, with all best memories of our meeting in Tiflis,”. Upon inspection, Petrokovksy’s remarks are comparable in style to those of a 1920s Leningrad review of another all-Liszt Horowitz recital. Glenn Plaskin’s 1983 biography of the pianist reproduces a similar passage: “His finger dexterity was incredible… the rapid scales seemed weightless and surrounded by air, each note gleamed and sparkled like tiny diamonds permeated by the sun. A magical magician! His interpretations of the Chopin mazurkas left a lasting impression that had nothing to do with bravura. They were a treasure: delicate with an astounding variety of timbre; so much fantasy and simply good taste,”. 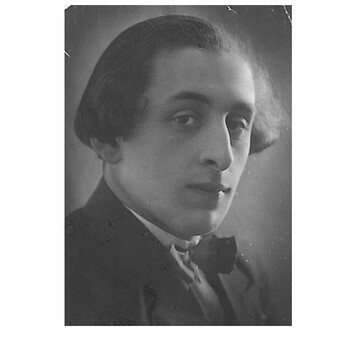 Born in Tiflis, 1888, A.S. Petrokovksy worked as an actor at the Komissarzhevskaya Theatre in Saint Petersburg. He collaborated with the popular “Apollo” arts magazine, the “Caucasus” (“Kavkaz”) newspaper, and in 1918, became editor of “ARS” magazine, which featured poet A. Anonovskaya as a publisher. With the establishment of the Soviet government in Georgia, Petrokovsky became active in the Central Education Committee (Glavkomprosvet), working on arts-related issues, and was hired on a permanent basis in the arts and culture department when the “Zarya Vostoka” newspaper was established in 1922. He served for 10 years, from 1926, as a deputy chief of the Chess and Checkers group, and organized the first Chess Tournament of Georgia. According to Mdivani, Petrokovsky organized tournaments for her father, Victor Goglidze, who became the first Georgian chess-master. In our 2014 interview with Mdivani, the pianist reveals that one of her father’s frequent chess opponents was none other than Sergei Prokofieff. In 1944, Alexander Samoilovich Petrokovsky was decorated with the “For the Defense of the Caucasus” medal; in 1946, with the medal “For Selfless Valiant Labour”. He passed away in Tbilisi, 1948, just before his 60th birthday.